A great dinner idea that consists of cooked macaroni with pesto chicken smothered in a red pepper and tomato sauce. Cover the macaroni with water in a pot and add olive oil and salt. Boil until al dente. While the macaroni is cooking, place the herbs, almonds, parmesan and garlic in a pestle and mortar and grind until you have a paste. Add olive oil to smooth it out. Set aside. Next, heat the butter in a saucepan and brown the chicken fillets until done. Season. Place the chicken in a mixing bowl and cover with fresh pesto. Set aside. Next, cut the pepper into pieces and grill in the oven until roasted. Transfer the roasted peppers and blanched tomatoes with the chili in a small saucepan and simmer for a few minutes. Blend in a food processor until smooth. 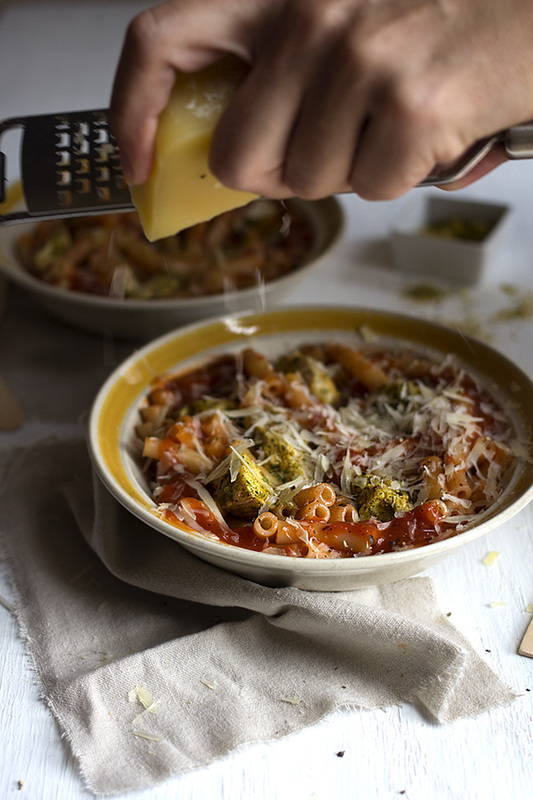 Combine the macaroni with pesto chicken and smother in red pepper and tomato sauce.